I received a complimentary unit download from Hoffman Academy in exchange for an honest review. All opinions are my own. Please read my disclaimer in the footer for more information. 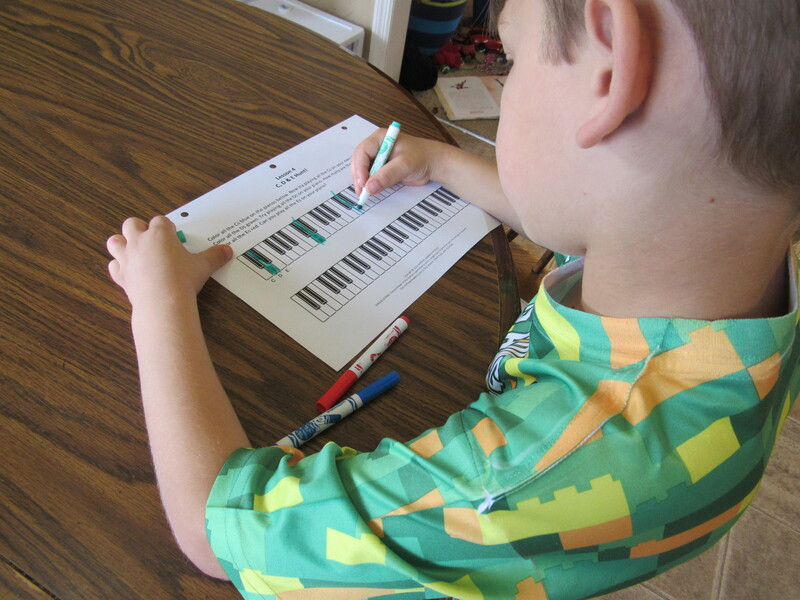 Free piano lessons for kids? For years, I’ve wanted the boys to enjoy piano lessons. I played myself as a kid and my parents even bought us a keyboard a few Christmas’ ago. I thought I could teach them some basic things by myself, seeing that it was a a fancy keyboard with a song bank and light up keys. Our “music time” ended up turning into them making up their own songs and although the song bank “taught” them how to play, they didn’t seem to be actually learning anything. I knew if I wanted them to actually learn to play and enjoy piano, I was going to have to get them some real lessons. But 3 kids x weekly lessons = a lot of money we didn’t have. Enter Hoffman Academy and my solution. When I found Hoffman Academy – a complete video-based music training program that focuses on ear training, improvisation, music theory, sightreading, solfege, (you Charlotte Mason fans should be really excited about now! ), technique, and rhythm (for free!) – I was more than excited to review it. So, what makes Hoffman Academy unique? We’re not just about showing you how to play a popular song or two. We’re going to give you a complete music education, from square zero, and we’re not going to leave anything out. No prior experience required. Hoffman Academy is great for homeschoolers and brick-and-mortor schooled kids alike, as well as adults. All you need is an internet connection and you can start immediately. When our twins were diagnosed with autism, we knew that would become the lens we saw things through when making choices for them – especially academic choices. We knew, like with any child, we needed to play to their strengths in looking for curriculum. One of the quickest things I began to understand about the way they learn is that they respond really well to video instruction. We’ve been closely watching the students who use our online program, and we’ve found that they have no problem keeping up with peers who use a live music teacher—in fact, sometimes they progress even better! That’s the power of using modern learning technology combined with Mr. Hoffman’s fun and research-based method. To see a complete breakdown of the benefits of online lessons versus live lessons, check out this link. To really enhance your lessons, Hoffman Academy has created five units of supplementing materials. These units are available for purchase at a VERY reasonable price and you can download them instantly. You can purchase them individually or as a complete set. For those of you teaching multiple children, be sure to purchase a family license so you can print multiple copies of the activity sheets without breaking copyright laws ;). We’re close to completing the first unit. We’ve been doing lessons about twice a week but I often find the boys practicing a song throughout the week on their own time. The boys were thrilled to learn a song at the first lesson and have enjoyed building their notebooks. I find the downloads really do enhance the lesson and we’ll continue to use them for the rest of the lessons. This is no watered-down program. Mr. Hoffman has a master’s degree in music, has studied early childhood education, and for years taught his very own Hoffman Academy of Music. His credentials are impressive, but moreso to adults than children. My kids love him because of his sense of humor, gentle, relevant teaching method and simple games that engage them. They especially look forward to the finger puppets at the end of every lesson…you’ll have to watch a lesson to find out what I mean. You can read Mr. Hoffman’s complete bio here. Fun? Yes. Engaging? Of course. But also rigorous and comprehensive, as well. As so well-stated on the website, “the aim of the Hoffman Method is to create well-rounded musicians who not only play, but who truly comprehend music.” As I mentioned early, the Hoffman Method focuses on ear training, improvisation, music theory, sightreading, solfege, technique, and rhythm. So encourage them. 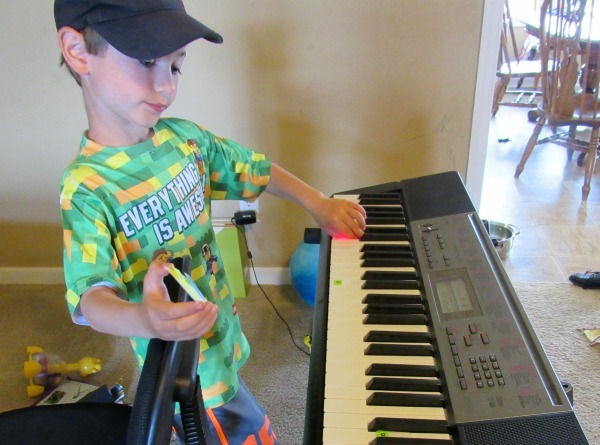 Our toddler often clmbs up to the keyboard to play a tune because children naturally learn from trying. From an early age all of my children have responded positively to all kinds of music. It feels like a totally natural next step to provide them with the opportunity to create music on their own. Mr. Hoffman refers to his teaching as a way to “put the music inside the child” which is exactly what we’ve seen happen in our home. According to Hoffman Academy, “online students save between $700 and $1,500 per year using our program.” The goal of Hoffman Academy is to make quality music lessons and education available and affordable for everyone. I think free is pretty affordable ;). Currently, there are 100 lessons, but more are being added. You can browse all 100 lessons here. So you’re thinking…sounds great, how do I get started? Have you ever heard of Hoffman Academy? How do you feel about video lessons? We absolutely love Hoffman Academy – hope you guys do, too! Thanks a lot for this Cindy. My younger daughter is learning Piano, and i think this would be a great opportunity for her to learn the basics and advance tactics.